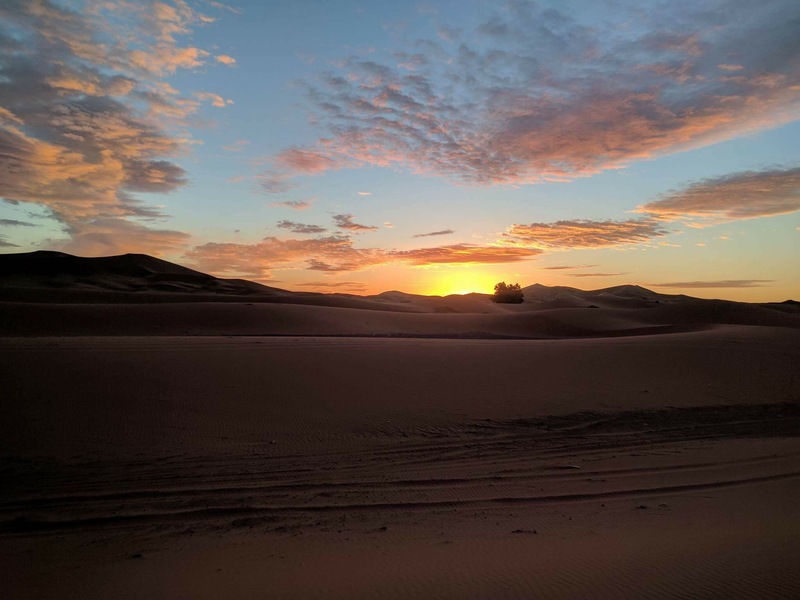 Life slowly illuminates as the dusty red Sahara dunes lazily charge with the rising morning sun, embracing the world from the underbelly, quelling the brisk 05:30 morning breeze. The blackness is retreating from behind; however, the tightly suctioned desert turban and my rather puffy eyes from the sandalwood smoke of last night’s Berber campfire work twofold to prevent my intentions of engaging my oblique muscles to watch it. 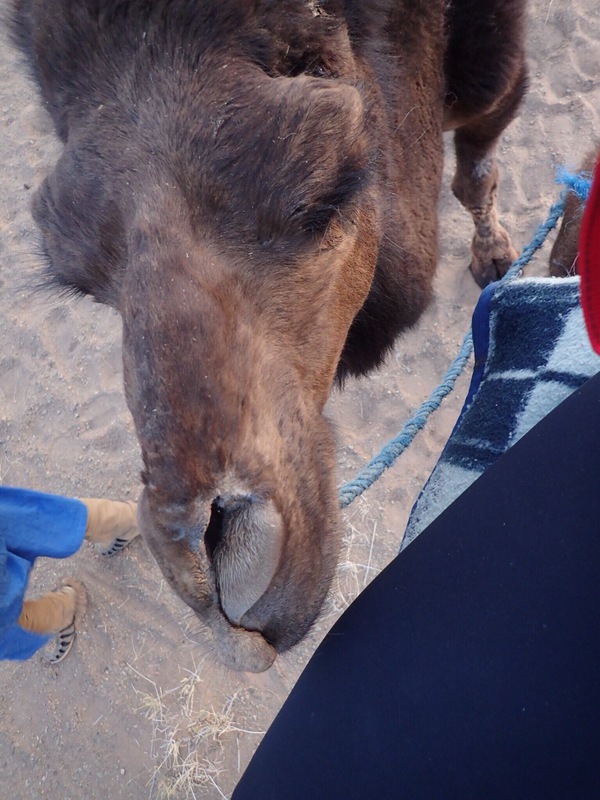 My right thigh is rhythmically heated by the sticky breath of the snotty camel in line behind me, his over-stretched nostrils often resting against my knee cap in a surprisingly comforting manner. 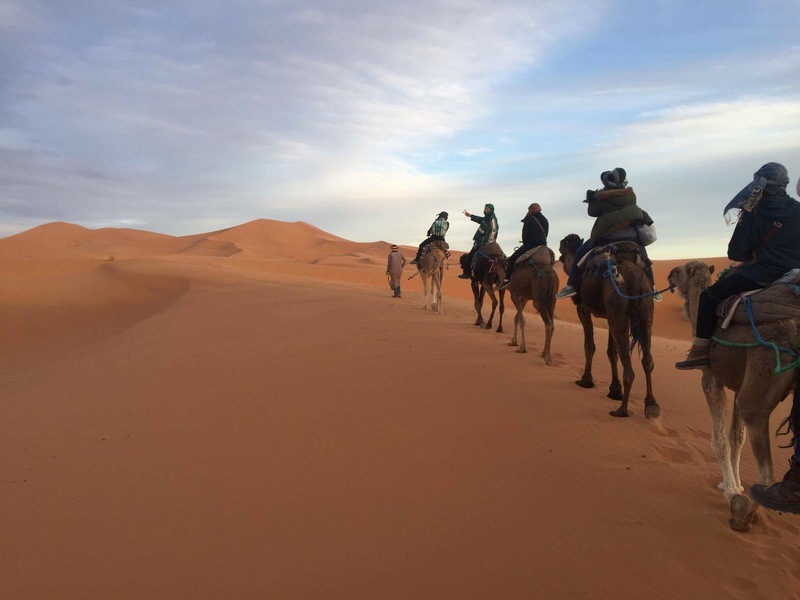 The camels greeted us well this morning with huge, guttural bellows and flails of slobbery foam. The entire scene screamed of Star Wars: from the Tusken-raider grunting of the camels, to the Mos Eisley dunes of the Sahara, to the draping cloaks of the desert guides pointed at the top in a hood, reminiscent of the droid-sellers. Coupling the fantastical aura with the magnificence of the full moon silhouetting the massive dunes led to a magical night of newfound friends chasing each other around the dunes, rolling down them in memory of childhood hills, and star gazing into the void of an oasis of peacefulness. Katie and I peaced out of Marrakech for a four-day-three-night jaunt to the dunes in Morocco; first to Zagora, then onwards to Merzouga. 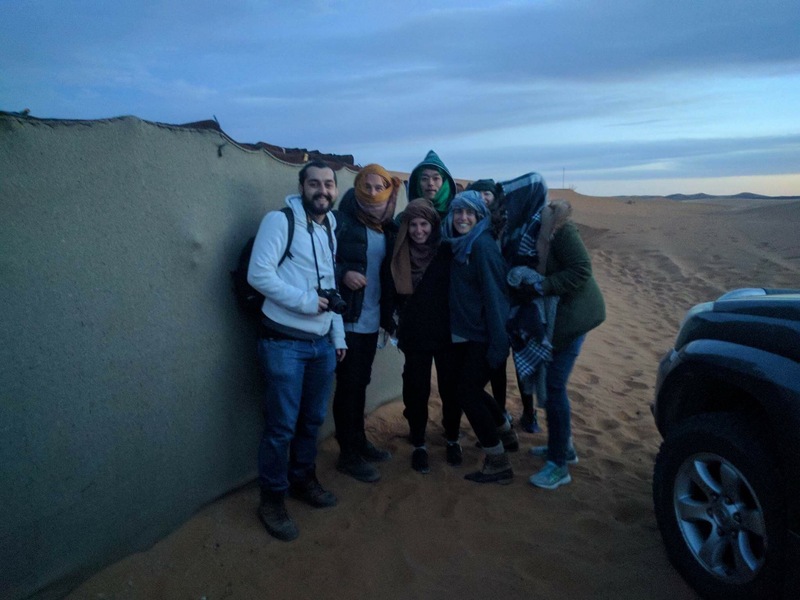 It took a full day of driving full-speed through the Atlas Mountains in a bumpy passenger van before we reached Zagora and hopped on our first camels. Fortunately, Katie and I have the innate ability to entertain ourselves, much to the chagrin of our Berber, relatively-toothless driver. Zagora, as described so beautifully by the turbaned, Moroccan Chris Rock who we met outside of a couscous cafe in Errouha, is the “coca-cola desert of Morocco”. 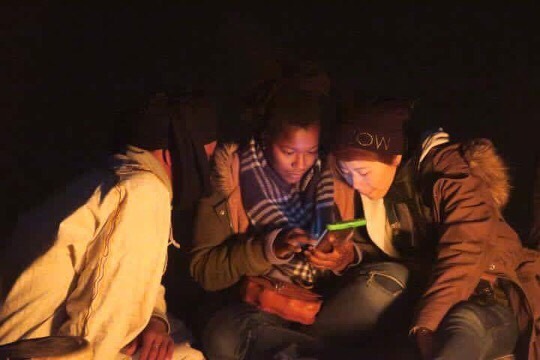 It was a grand first experience, and spending the night in a Berber camp under the stars after a drum-featured campfire is my idea of a good night any time. 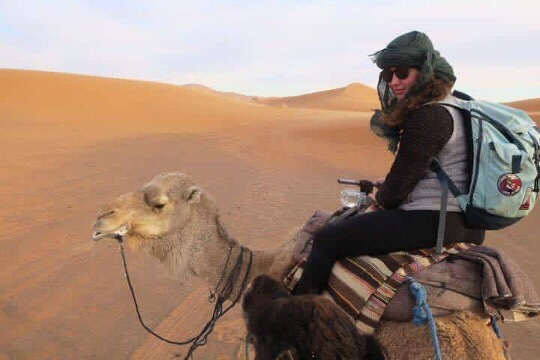 But Merzouga was where it was really at. Massive, expansive red dunes. The spray of sand whipped over the crests much as the shadows of clouds pass over a meadow on a windy day or the lazy snaking of whispy snow over a highway. The dunes were great, the guides were hospitable and welcoming, the camels made my already sore obliques ache from laughter. But, much as the trend is, it was the people that made it all so magically delicious. Thus far, Katie and I have met so many wonderful people at each hostel that we’ve stayed at. In Fez, the brilliant ultra-smiling duo of Michael and Sarah from Virginia and Switzerland, powerhouse Elena from Berlin, super wonderful Lindsey and Lauren from the States. In Marrakech, meeting Daunte for the first time, along with Marco of Italy and DJ Jerry of San Fran. The Swiss girls of Dominque and Noelle and the Brazilian Luis heading to Zagora. Many many others, locals like our beautiful philosopher guides and the women who work with Argan oil. The beautiful Julia, an Agadir local who taught us the lay of the public transportation and how to say goodbye the Moroccan way, after giving us her phone number and instructing us to call her anytime we need to use the bus system again. 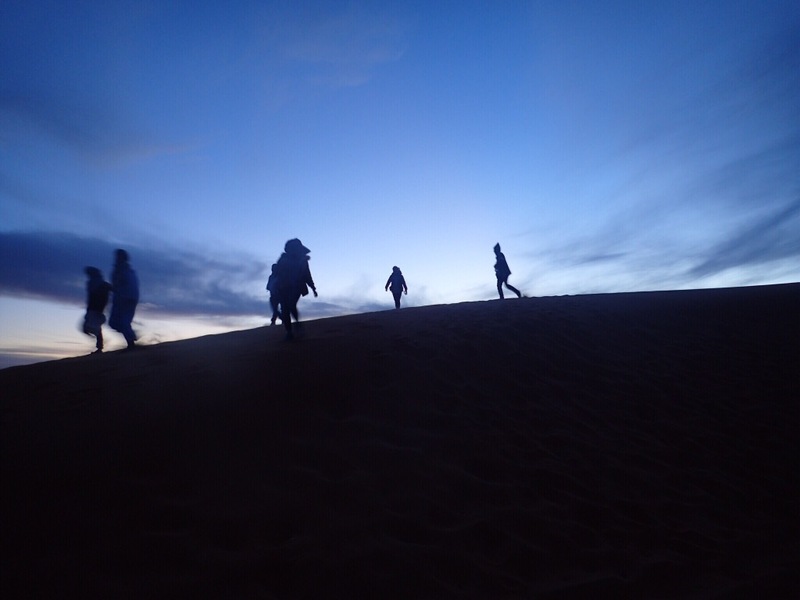 The tribe we trucked out to Merzouga with was pure magic. 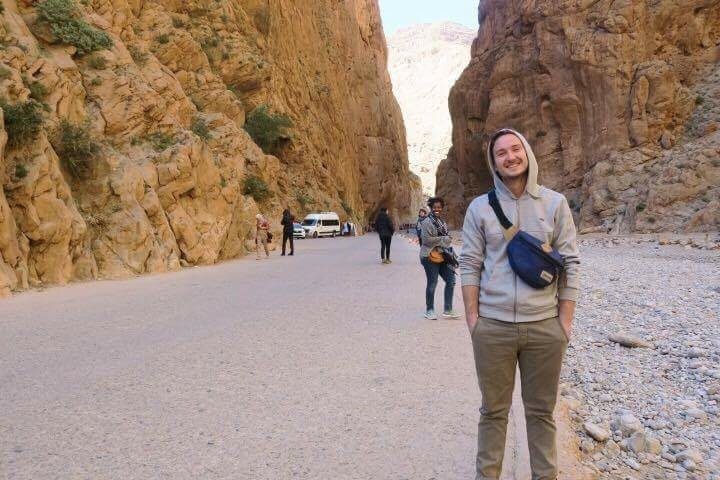 There would be no one else I would spend 22 rather nauseous hours trapped in a Moroccan van with a driver who wouldn’t let us stop for lunch, squashing our protests with his own chuckling replies of, “today is Ramadan for you. Ramadan, Ramadan.” In a sing-songy voice reminiscent of Gollum’s mutterings. Daunte, and ode to you, you beautiful, shameless voyager. I know there’s an apostrophe somewhere in your flowing name, so apologies for that. This chick has been traveling on her own around Southeast Asia and beyond since September, with an insatiable love for people and a hilarious bluntness. She says exactly what she’s thinking and what she means, I don’t know if I have ever met such a wonderfully shameless inclusive person before. 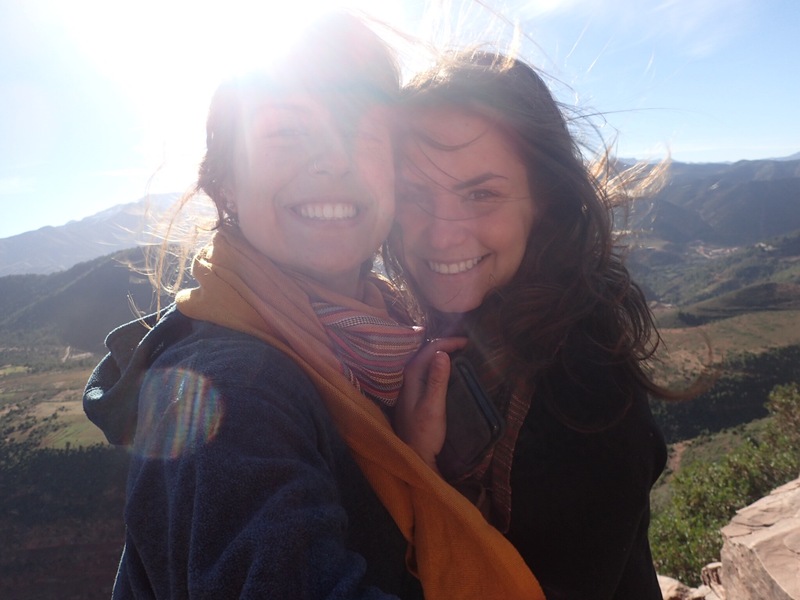 Juliette, a magical curly-haired Coloradan who has done about as much adventure as one can possibly. It was absolutely brilliant chatting with you and sharing adventures, 1000 well-wishes on your studying in Cape Town. Tom and Melanie, you might be my favorite couple ever. The just-outside-of-Dusseldorfian duo who let Katie and I speak German to you and did the best you could with replying to us. I don’t know if I’ve ever laughed before as much as I did with Tom adding “brother” in Berber after every sentence with our driver from the back of the van. Scott, your insane 12-month “vacation” around the world is nearly incomprehensible and intensely inspiring. Thanks for giving me the deets on Nepal and sharing book-love. Never cut your hair, keep looking like Leo DiCaprio. The Belarusian couple with the wonderfully positive enlightened attitudes on all aspects of life, the intimidatingly adventurous solo Japanese kindergarten teacher, the Hungarian family from Vienna. You’re all top notch, it was an absolute honor to trek with you. 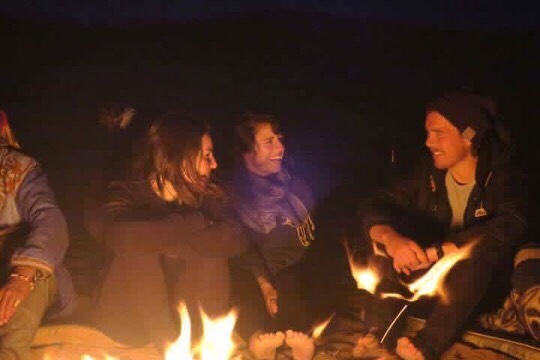 Desert memories will forever be couple with images of friendship, campfires, tagine and bellowing camels.